When it ships on Sept. 20, Apple’s iPhone 5s will be the first and only smartphone on the market powered by a 64-bit processor — but not for long, if Samsung can help it. J.K. Shin, Samsung’s mobile chief, said on Wednesday that his company also has 64-bit devices in the pipeline. “Not in the shortest time, but yes, our next smartphones will have 64-bit processing functionality,” Shin told the Korea Times. Samsung’s current flagship smartphone, the Galaxy S4, runs a 32-bit chip, which is plenty powerful for the tasks it performs. But, like Apple, the company is also looking ahead to an era of more resource-intensive smartphone applications that will benefit from 64-bit chips that can address larger amounts of memory. That era’s not quite here yet, though. Indeed, there’s little to be gained from slapping a 64-bit chip into today’s smartphones, aside from being the first to say you’ve done so. As Moorhead notes, in order to really take advantage of all that 64-bit offers, you need a smartphone with more than 4GB of RAM. 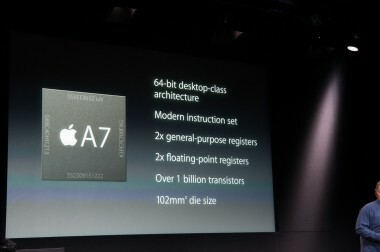 And that much RAM requires significantly more power to run. And, as Apple and Samsung are both well aware, more than processing power, battery life is of paramount concern in today’s smartphones. That said, Apple clearly has the jump on the industry here, not simply because it has built the first 64-bit smartphone, but because it has designed iOS 7 to support a 64-bit chip. Google hasn’t yet transitioned Android to 64-bit. Until it does, it makes little sense for Samsung to build a 64-bit phone.